The gastric cardia represents a transition zone between the squamous epithelium of the oesophagus and the oxyntic epithelium of the body of the stomach. Virtually absent in the neonate and probably a metaplastic response to acid exposure, it is a site of high prevalence of pathology, particularly neoplasia. 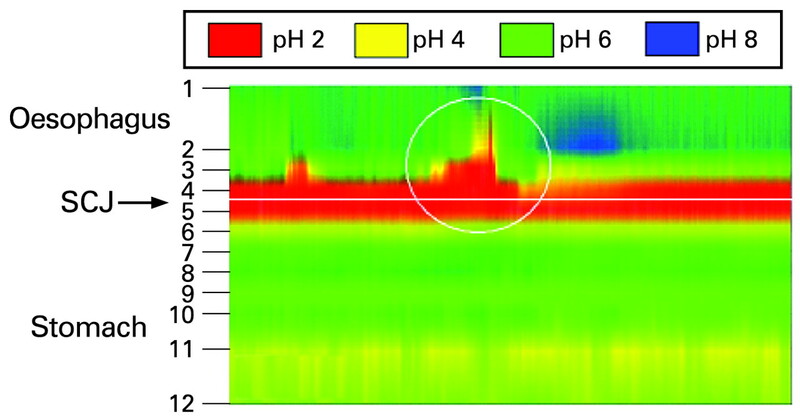 The authors use a high definition pH probe clipped to the gastro-oesophageal junction, which allowed simultaneous reading of pH at 12 sites over a 10 cm length. Probes within the cardia showed a high pH during the fasting period. Postprandially, a distinct acid pocket pH<4 (see fig) developed after about 30 minutes and remained acidic for the next hour, while probes within the body of the stomach showed pH>4 due to acid buffering by the food. The pocket of acid in the cardia was the source of postprandial acid reflux (see fig). Acidification of the cardia following postprandially is postulated to be relevant to the high incidence of inflammation and metaplastic changes noted in this region. Plots of pH against time between 46.5–48.5 minutes postprandially. Probe position is shown on the vertical axis and time on the horizontal axis. Acid pocket is shown with an episode of reflux half way through the 2 minutes record. SCJ, squamocolumnar junction. Sulphate (SO42-) is an abundant anion in plasma and is essential for numerous metabolic and cellular processes. Sulphate conjugation (called sulphonation) of structural components (such as proteins, cholesterol and carbohydrates) is essential for the maintenance of normal structure and function of tissues. In this study, the authors use mice lacking the hyposulphataemic NaS1 sulphate transporter to study the consequences of a disturbed sulphate homeostasis. They show that Nas1 knockout mice have a reduced sulphomucin content in the ileum, making these mice more susceptible to dextran sulfate sodium-induced colitis and systemic infection when challenged orally with Campylobacter jejuni. Therefore, sulphate homeostasis appears to be essential for maintaining a normal intestinal metabolic state and hyposulphataemia may lead to increased susceptibility to toxin-induced colitis and bacterial infection through an impaired intestinal barrier. 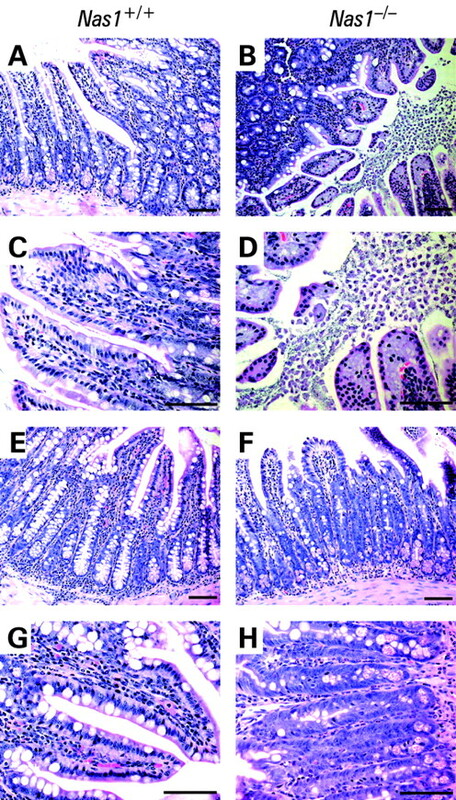 H&E-stained ileum from Nas1+/+ and Nas1-/- mice, orally inoculated with Campylobacter jejuni. There is increased damage in the ileum in Nas1-/- mice when compared with Nas1+/+ mice. In Nas1+/+ mice, even when inflammation is present (E, G), the villi remain intact, whereas in Nas1-/- mice there is more damage and shedding of villous epithelium (B,D) leading to loss of villi and elongation of crypts (F,H). Nas1+/+, wild-type mice; Nas1-/-, NaS1 sulphate transporter null mice. Increased risk of thromboembolism is an important feature of active Crohn’s disease (CD) in which platelet numbers are increased. These platelets also show a number of activation features, including increased release of soluble CD40 (sCD40) ligand, a member of the tumour necrosis factor family, which contributes to inflammation by inducing chemokine production and activating endothelial cell adhesion proteins. This study examines the role of matrix metalloproteinases (MMPs) in platelet activation in 21 patients with CD. As expected, the patients’ platelets contained more CD40 and expressed more surface CD40 than controls. The authors hypothesise that MMPs are important in mediating sCD40 shedding and show that inhibiting MMPs with a nonselective inhibitor GM6001 reduced shedding of sCD40 and reduced fibrinogen binding to platelets. Platelets from patients with CD had increased MMP9 content and release. The authors then show that a specific MMP9 inhibitor reduced release of CD40 from healthy platelets activated with thrombin receptor-activating peptide (see fig). This increased understanding of mechanisms may lead to better treatments to reduce the platelet activation and inflammation associated with CD. 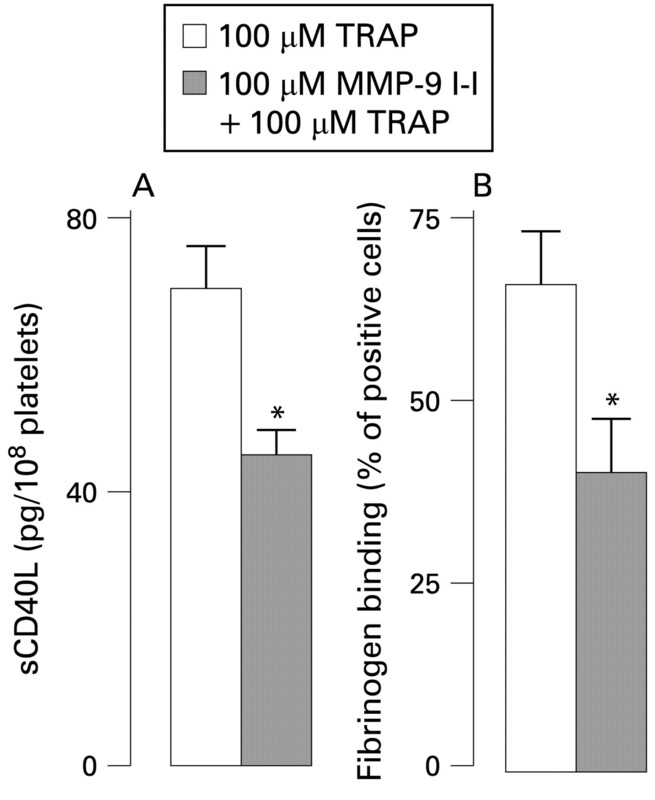 (A) Matrix metalloproteinase-9 inhibitor I (MMP-9 I-I) reduced shedding of soluble CD40 ligand (sCD40L) from platelets activated by thrombin receptor-activating peptide (TRAP) and (B) reduced fibrinogen binding to platelets. More than 40% of patients with CD develop fistulising complications. Anti-TNF antibodies are very efficacious for this condition, mainly in the treatment of perianal fistulas. 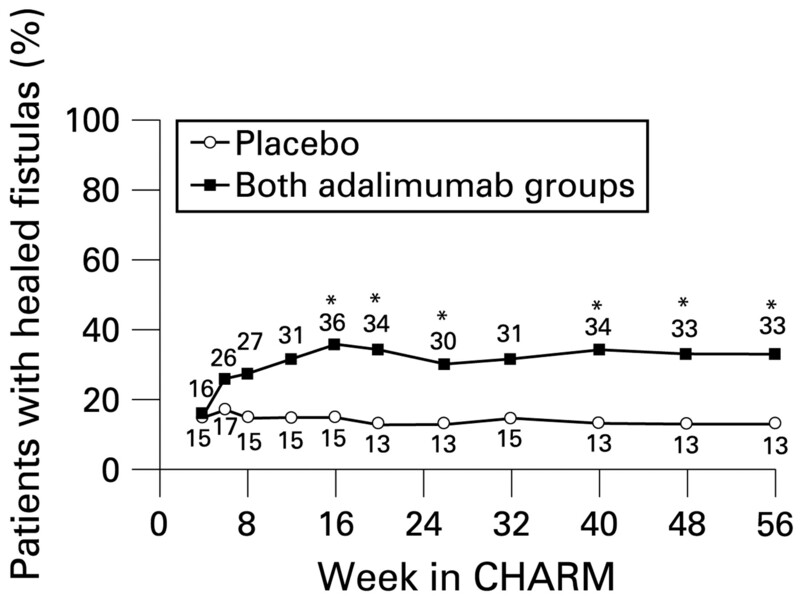 Adalimumab is a human monoclonal antibody to TNF and is effective for induction and maintenance of remission in moderate to severe CD, as shown by the CHARM study, a Phase III, randomised, double-blind, placebo-controlled, 56-week study. This study analyses the efficacy of adalimumab in the healing of draining fistulas in the 117 patients from the CHARM study who presented with draining fistulas. After open-label induction treatment with adalimumab (80 mg/40 mg at week 0/2), patients were randomised at week 4 to placebo or adalimumab 40 mg every other week or weekly. The authors show that the mean number of draining fistulas significantly decreased in adalimumab-treated patients compared with placebo. Complete fistula healing was also sustained for up to 2 years in 90% of patients in the open-label extension trial, called ADHERE (Additional Long-Term Dosing With HUMIRA to Evaluate Sustained Remission and Efficacy in CD). Percentage of patients with fistulas at baseline who had complete fistula healing over time in CHARM. *p<0.05 for combined adalimumab groups (40 mg every other week and 40 mg weekly) compared with placebo for the intention-to-treat population. Most infections of hepatitis B virus (HBV) result in viral clearance but the early events in man are poorly studied. Chimpanzee studies suggest a poor innate immune response. This study utilises two blood donors undergoing periodic serological and virological screening who were found to have become infected with HBV. The authors uniquely were able to follow the early stages of HBV infection with a rise of viral DNA and its subsequent clearance. This was associated with an increase in natural killer (NK) and natural T (NT) lymphocytes (see fig). High expression of activation markers on the surface of NK and NT cells indicated very early activation in the course of infection. NK function, as assessed by cytotoxicity, increased progressively, peaking just before HBV DNA clearance, as did interferon-γ production. Ex vivo T cell analysis showed that T cells responded initially to peptides of the envelope and polymerase regions, followed later by response to core peptides. This study considerably extends our knowledge of the early response to HBV and indicates that in humans the innate response is early and efficient. 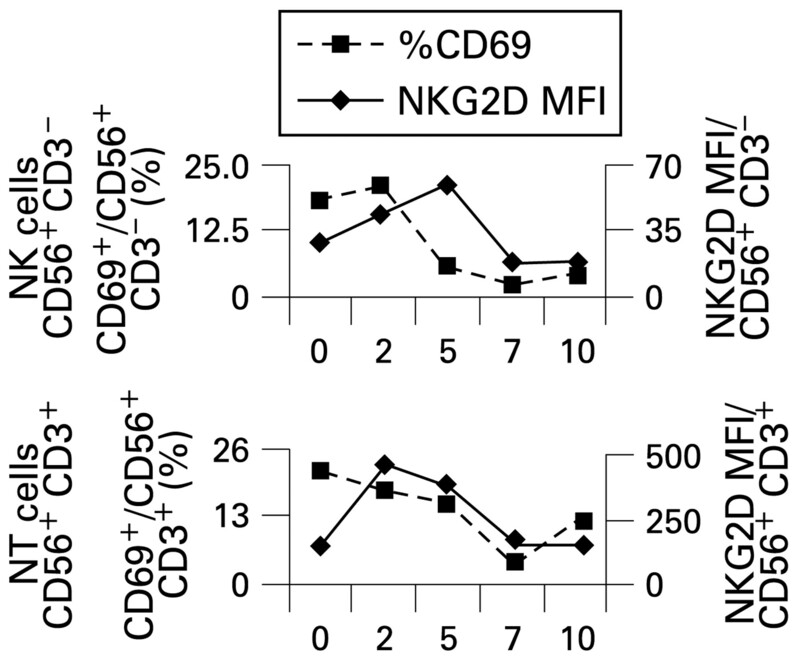 Percentage natural killer (NK) and natural T (NT) cells showing the activation marker CD69 plotted against weeks from HBsAg detection, indicating early activation of the innate immune system. The majority of patients with primary biliary cirrhosis (PBC) have antimitochondrial antibodies (AMA). These antibodies react with an inner mitochondrial membrane antigen that has been named M2 and consists of five subunits, M2a-e. The target antigens have been identified as subunits of the 2-oxoacid-dehydrogenase complex (OADC). Using these OADC-related antigens in sensitive methods, antibodies can be detected in 95% of PBC patients. However, 15–20% of patients with PBC are anti-M2 negative on ELISA despite a typical AMA-staining on immunofluorescence. In this study, the authors search for the antigen of these non-M2-related AMA. They tested the sera of 27 AMA-positive/anti-M2 negative patients with PBC by Western blotting against various supernatants obtained after sonication of mitochondria from rat liver, bovine heart and pig kidney. They found that 52% reacted with a 60 kDa protein and eight (29%) with an 80 kDa protein. 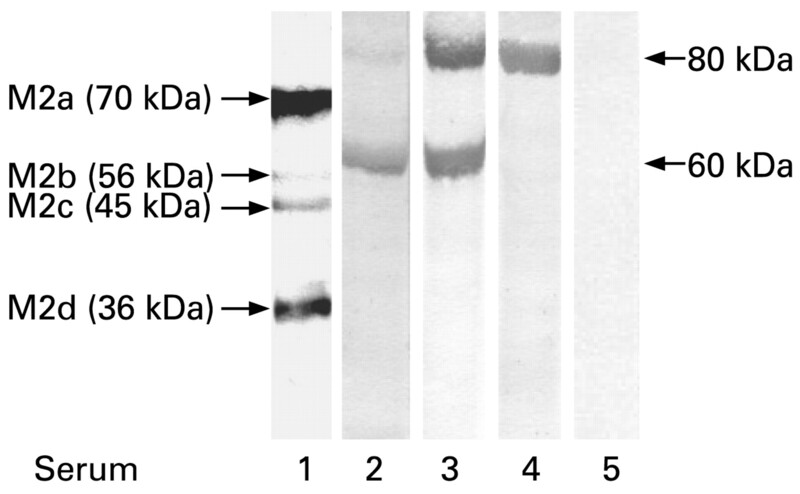 In the 60 kDa band, components of the mitochondrial enzymes F1F0-ATPase, ubiquinone cytochrome c reductase and acyl CoA dehydrogenase were detected by MALDI–TOF analysis; the 80 kDa protein could not be further characterised. Their findings may represent additional marker antibodies for the serological diagnosis of PBC. Serum 1 shows a positive reaction with the 60 kDa protein but is negative with M2. Serum 2 recognises the 60 kDa antigen and, in the M2-fraction, additionally the M2a (PBC-E2)- and M2b-determinant (E3-binding protein of PBC) at 70 kDa and 56 kDa and the anti-M2 positive serum 3 reacts with subunits of the M2 antigen (70 kDa and 56 kDa) but not with the 60 kDa antigen.